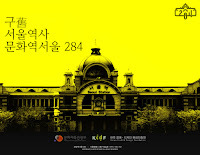 After two years of renovation, the Old Seoul Station has just been reinaugurated as "Culture Station Seoul 284" (문화역서울 284), a name that echoes the status of this 111 year-old building (Korean Historic Site No. 284), as well as its new purpose. Note that this red brick landmark already hosted ASYAAF 2008, and that the following year, the old Defense Security Command welcomed the memorable 2009 edition before experiencing itself a similar metamorphosis*. The Former Seoul Station Building's metamorphosis is limited (the outer shell and the first two floors have been preserved) and progressive : a first exhibition starts today and will last until February 11, 2012, the official opening. In March 2012, all facilities will be fully functional. So the countdown has started, and "Countdown" is precisely the name of the inaugural exhibition, where 20 Korean artists present their works or perform live. Even if Cultural Station Seoul 284 (an echo to Paris 104 ?) seems less ambitious than the future MOCA, it fills a cultural void at a major gateway and shall welcome many visitors, including people in transit in this multimodal transportation hub. What a decade for Seoul ! After the 2004-2005 wave (Leeum, Seoul Museum of History, new National Museum of Korea...), another batch of cultural venues is on its way : beyond this "284" and Seoul MOCA, let's not forget the future "National Museum of Contemporary History"**. * a future key cultural asset, see "http://seoulvillage.blogspot.com/2010/02/moca-defense-security-command-continued.html"
** construction started soon after our focus (see "A National Museum of Korean Contemporary History ???"). *** They write "1 Dongil-ro" but the actual spelling is 1 Tongil-ro. Eastern Seoul's main axis (it follows subway line 3), Tongil-ro continues beyond Gupabal and Seoul city limits, but the axis used to be called Uiju-ro between Seoul Station and Hongeun Sageori. Yet another change for this Old Seoul Station Museum : the station's official address used to be 112 Bongnae-dong 2-ga, Jung-gu, but some people mentioned Dongja-dong in Yongsan-gu.